Artists display their works along the Saugatuck River during the 36th annual Westport Arts Festival in 2009. This year's event will attract 145 juried artists to the river's banks. 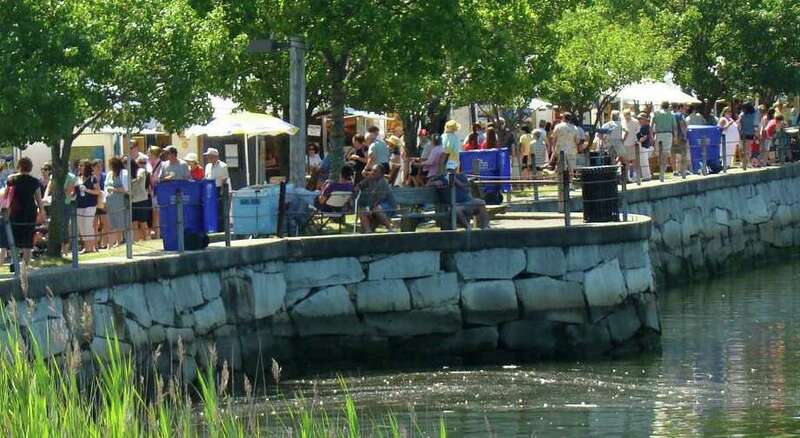 The Westport Fine Arts Festival will soon return to downtown Westport for the 38th year with 145 juried artists displaying original works in drawing, mixed media, painting, photography, printmaking, sculpture and watercolor. The event, which will be presented along the banks of the Saugatuck River by the Westport Downtown Merchants Association, will be held 9 a.m. to 6 p.m. July 16 and 10 a.m. to 5 p.m. July 17 in Parker Harding Plaza and on Gorham Island. "The artists recognize and truly appreciate that the local community supports the arts with such a high level of sophistication and interest," Steve Desloge, event chair and owner of Rockwell Art & Framing, said in a statement. Artists appearing at the festival for the first time include Kristin Krongard, a master gardener who has also trained at the New York Botanical Gardens in Bronx, N.Y., as a landscape designer. She uses scanner photography to create images of common garden flora in a technique differing from traditional photography where she brings the subject to a flatbed scanner. Another first-time exhibitor will be Peiliang Jin, a Shanghai-born artist who combines East and West through traditional and modern art. He studied traditional Chinese painting for 17 years in Shanghai, studied modern art at the Dusseldorf Art Academy in Germany and also received a degree from the Fashion Institute of Technology in New York. His stylistically unique technique is inspired by classical training in ancient Chinese watercolor methods. His work has been exhibited in many shows and appears in over 100 private collections. Steve Alpert, of New York City, is also a newcomer to the show but not to Westport, having exhibited at Gallerie Je Reviens in the past. He starts his landscape paintings with no goal or arrival point in mind at the outset, often beginning with a sky or a horizon line. One of his paintings, "Fields of Gold," references three locations: Ireland, Hawaii, and upstate New York. In addition to artwork, the festival will feature children's activities, refreshments from local restaurants and entertainment, including street performers, musicians, face painters, a balloon artist and a mime. Westport Arts Center professionals will again set up their tent for a hands-on art experience, where children of all ages can make multi-media collages, Picasso-inspired 3-D musical instruments and fans using a wide variety of materials. "We hope that the public will come out and fall in love with that special, must-have piece of artwork to bring home," WDMA Special Event Producer Cathy Colgan said in a statement. "But even if not everyone does, we still want to provide an opportunity to enjoy our beautiful downtown and experience a 38-year-old Westport tradition." The festival will also grant an opportunity to view the town's new Gateway Gardens framing each side of the downtown entrance to the Ruth Steinkraus Cohen Bridge. The LaurelRock Company has donated its design/build services to create the new gardens, which are valued at $35,000 and will be unveiled during the festival, in cooperation with the Westport Beautification Committee and the Downtown Merchants Association. A dedication ceremony is slated for 1 p.m. July 17. Admission to the festival is free. Visit www.westportfineartsfestival.com for information.